"Be Open, Be Transparent, Be Authentic" are the current leadership mantras - but companies often push back. Traditionally business is premised on the concept of control and yet the new world order demands openness. 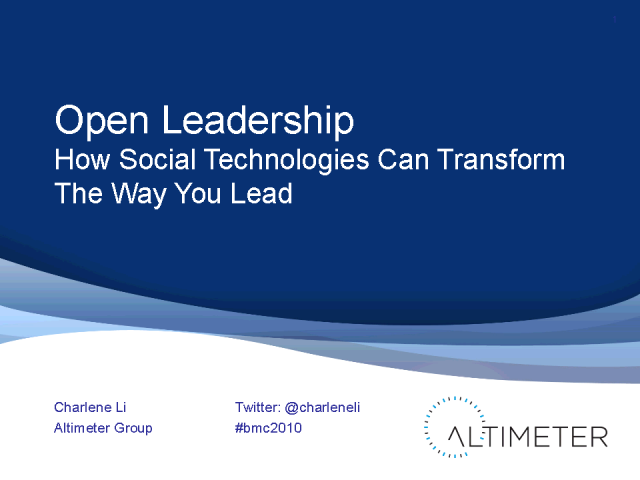 In this powerful 30 minutes, drawn from best-selling author Charlene Li's ("Groundswell") newest book "Open Leadership," you will learn how to tap into the power of the social technology revolution and use social media to be "open" while maintaining control. As Li will explain, openness requires MORE - not less - rigor and effort than being in control. In this free webinar, she will will reveal step-by-step, with illustrative case studies and examples, how to bring the precision of this new openness to bear both inside and outside the organization.